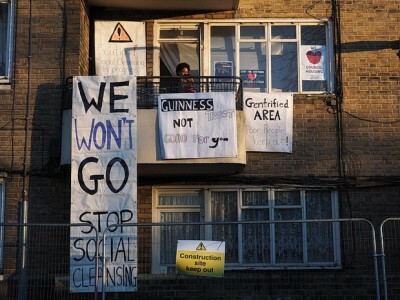 Yesterday, an empty flat in Elveden House on the Guinness Trust estate in Brixton was occupied by local residents and supporters protesting at the threatened eviction of dozens of Guinness tenants from the estate. More people have joined the action today and they plan to keep the occupation running until Guinness agree to halt all evictions and rehouse all the tenants in local social housing. A protest is planned outside the Guinness estate office tomorrow morning Monday 16 February at 9am. The first eviction is due to take place on Thursday 19 February and protesters have vowed to resist any attempt by bailiffs to remove the family from their home. The tenants facing eviction are ‘shorthold’ tenants – but many have been there for ten years and longer. The evictions will make way for Guinness to demolish the blocks and build luxury apartments which will go on sale at full market rate. Of course none of the tenants being evicted can afford to buy the new flats and are facing leaving London, jobs, schools, friends and their community to find somewhere affordable to live. But many residents are saying no and refusing to go.